Certain groups are alienated by Beijing’s reforms — even groups that should logically be supportive of the effort. A famous China specialist from the United States recently pointed out while visiting Sydney that three groups of people support Xi Jinping’s anti-corruption and reform efforts: the masses, the middle class, and mid- to low-ranking military officers. He also grouped the opponents into three categories: party officials and interest groups (including the rich and elites), high-ranking officers, and intellectuals. Obviously this division is too simple. The scholar reached this conclusion based on Xi’s actions after he took power, rather than on-the-ground research. 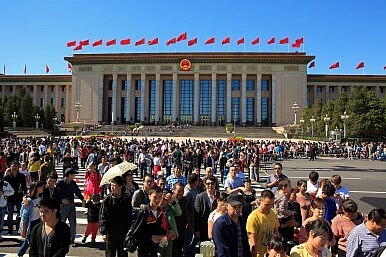 For example, since Xi assumed office, he has mainly instituted anti-corruption measures to put “power in the cage of regulations.” Xi has made examples of party and government officials as well as high-ranking military officers; therefore this scholar assumes that the thousands of officials in those categories oppose the reforms, which is not true. Last month I wrote a blog piece titled, “Do Civil Servants Not Support Xi’s Fight Against Corruption?” In that piece, I reviewed a similar argument and pointed out that Xi’s anti-corruption campaign is actually supported by the vast majority of grassroots civil servants and honest officials, because they see in the campaign the promise of a new way of life. Meanwhile, the scholar put China’s middle class into the “pro” group for anti-corruption and reform, which is theoretically true, because Xi is the first Chinese president to stress supporting, cultivating, and expanding the middle class. In reality, however, a considerable proportion of the Chinese middle class are affiliated with one interest group or another, so they’re not that interested in anti-corruption or are even somewhat worried about it. Some other sections of the middle class have lost their confidence in reforms after being pulled in one direction and then another by previous efforts. A friend of mine who works in immigration tells me that a steadily increasing number of middle class Chinese have chosen to emigrate in the past few years. Of course, the categories put forth by this American scholar do contain some truth, which deserves the careful consideration of China’s leaders. Indeed, China’s reform has entered deep waters. The situation is completely different from the 1980s when embarrassing scarcities were everywhere — from the national treasury to barns and people’s pockets. Back then, when reforms were implemented, they benefited a clear majority of people, and those who were harmed by reforms weren’t very noticeable. Deng Xiaoping became the chief architect of China’s reform and opening-up and won the respect and support of the people not only because he adapted to the times, but also because all of the reforms he put in place gained widespread praise. Anyone who watched the recent documentary series Deng Xiaoping at History’s Crossroads knows that once Deng took office, he reinstituted the college entrance examination system. While seemingly insignificant, this turned out to be a critical decision: this measure helped the diminutive leader win the support of thousands of young students, even though he had been previously been disciplined by Mao Zedong three separate times. Then Deng took steps to redress unjust cases from the Cultural Revolution, such as Hu Yaobang’s case. After several such cases had been dealt with, the intellectuals who had been tortured by Mao committed themselves totally to Deng. With the “sent-down youth” returning to the cities, these young people also owed their gratitude to “Grandpa Deng.” And by fixing farm output quotas for each household, he even liberated the vast majority of farmers from land restrictions. Looking at these reforms, did any of them fail to win great applause or a high degree of consensus? How could Deng fail? Today, reforms have a harder nut to crack. The achievements of the past 30 years of reform have been controlled by some interest groups; their monopoly has to be broken to allow for further reforms. In this situation, once a reform plan is released, the “victims” feel the pain before the beneficiaries see any positive results. Opposition is everywhere with such reforms; how can we get a consensus? Reforms are challenging; apart from the lack of consensus, there are other problems. Yes, fighting “tigers” is brave and some regulations have begun to be established, but this cannot live up to the expectations of the public. Both inside and outside the system, people are looking forward to the transition from officials who “dare not be corrupt” to officials who “cannot be corrupt.” However, the brutal punishments of corrupt officials have not yet transformed into systematic restraints on corruption. There’s still no notable sign that systemic anti-corruption is on the way. Compared with the reform measures in the 1980s, the beneficiaries of anti-corruption today have not yet seen significant “gains.” Some people even lost hope after seeing the widespread extent of corruption. And what about the elites within the system? What they care most about is institutional corruption, but the current crackdown is only focused on corrupt people, not on the system that made them corrupt. So even these elites aren’t convinced. I have said many times that for China’s reforms to succeed, the work of government officials is crucial. It is very important to protect the interest of the majority of the civil servants even while implementing systemic anti-corruption, in order to maintain their enthusiasm. As to the intellectuals being classified in the “anti-reform” group, this too deserves Beijing’s attention, although I don’t fully agree with this point. For example, almost all the intellectuals I know are in favor of the reforms toward “rule of law.” But while we are still jubilant about these reforms, even while the government is advocating the rule of law, some departments and local governments have fabricated new, illegal cases instead of following Deng Xiaoping’s example and redressing injustices. Some cases related to intellectuals, which should be dealt with according to normal judicial procedures, have been botched. The government loses much acclaim and support as a result; this matter should not be neglected. As far as the “12 core socialist values” are concerned, I support this completely and have even been given the title “overseas propaganda department” by foreign academics and media outlets. Instead, maybe the label “ziganwu” is more accurate. Traveling around China, I’ve seen the government making great efforts to publicize and promote the socialist core values, including “freedom, rule of law, and democracy.” Freedom, rule of law, and other values are spelled out in twinkling neon lights on many city buses. We haven’t seen this in decades – how can I restrain my excitement? How can I not spread the news? For the government, this is not only a way of uniting intellectuals with other people of vision – it’s the magic ingredient for a cohesive Chinese nation. However, there are some departments and officials who instantly label freedom, rule of law, and democracy as “universal values” of the Western world. They try every possible way to separate China’s “freedom, rule of law, and democracy” from the West’s, to set these concepts against each other and even have them destroy each other. Do you think you can say that black is white and white is black, that everyone else is stupid? The behavior of such people wastes all the government’s efforts and fills some intellectuals’ hearts with fear. As a result, those who once confidently supported reform are now suspicious. Generally speaking, anti-corruption and reforms are supported by the masses and the middle class, but this is far from enough in a state with single-party rule. In addition to its efforts to set clear goals, build consensus, and promote mutual understanding and tolerance, the government also needs to integrate various classes of society to contribute to the great rejuvenation of China with one heart and one mind. I hope this is not a foolish dream, but the “Chinese Dream” of all the people. Xi Jinping's Reforms: 'Mission Impossible'? The cynicism surrounding Xi's reforms are making a difficult task even harder.